In modern construction process many difficulties are resolved by application of different equipment and chemical compounds. Once water curing was the only curing method for concrete. But when conservation, cost of curing labor, availability of water are concerned, membrane curing is the smart and economical solution for those situations. Concrete construction works have become popular from couple of centuries. This popularity produce a large volume of concreting works requiring subsequent curing and water curing for every concrete work need large volume of water. Considering this, some curing compounds are used in curing purpose. In the upcoming posts we will learn such curing compounds. 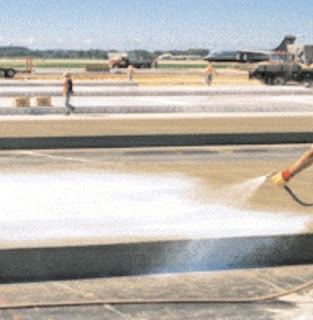 Many people have doubt about the performance of membrane formed by curing compounds in preventing moisture to escape from concrete surface. It is clear that membrane curing is not as efficient as water curing, the ideal. Water curing is considered as ideal curing process. But the targeted efficiency is 80% of water curing and this 80% must be achieved. Any efficiency less than that are not allowed. In case of application of polyethylene sheet or water proofing papers, care should be taken not to have any leakage in this sheet. When the sheets are need to lap with other, proper overlapping should be provided and lapped joint must be sealed properly. Theoretically water curing process is ideal. But in many practical situations it is found that intermittent curing are provided in field leaving a period when the moisture can escape hampering hydration process. In this case, the efficiency of water curing is much lower than provided 80% of ideal one and membrane curing, if properly done, produces a better results.